Raina Telgemeier is my go to author for graphic novels lately. Apart from manga, it's been a long time since I've read anything in that genre other than her books. I read Smile, which is a companion to Sisters, a few months ago and loved it. Fortunately, Sisters is just as good. From the plot synopsis, I expected Sisters to be a bit on the younger MG side - more than Smile was. In a way it is, but both Sisters and Smile have a timeless feel to them that will appeal to 12 year olds and 32 year olds alike. Smile was a wide-ranging book about the trials and travails of middle school / early teen life. Sisters is more contained and focuses on Amara and Raina's relationship. It switches from present day when Raina and Amara are 14 and 9 to the past. In the past, we see 5 year old Raina begging for a sister. 6 year old Raina is not so impressed with screaming Amara who has to share her room. Their relationship develops into a love, hate, mostly hate sisterly bond for the flashbacks. In the present day, there are more hints of teenage angst as Raina has to figure out how to deal with her similar aged cousins. The girl has grown up much faster than Raina while the boys are goofy, immature, but also unimpressed by Raina. It's a little depressing but very realistic. We see Raina and Amara squabble endlessly during their long car trip, but also bond as Raina's cousins aren't what she remembered them to be. You get hints of the close friends that the sisters will surely become as adults. The drawing of the novel is fantastic. The story flows quickly and clearly. By seeing the characters' emotions as well as reading their dialogue, you get a much richer world than by prose alone. Since I read an ARC, most of the story was still in black and white. It was really fascinating to see just how important color is to add depth to the images. It was still wonderful without color, but it gave me a greater appreciation for the artistic quality of the finished version. You don't need to have read Smile to read Sisters, although I highly recommend both. I enjoyed Smile a little bit more than Sisters, but that's probably because I can relate to a nerdy coming of age story better than a sisterly relationship story. 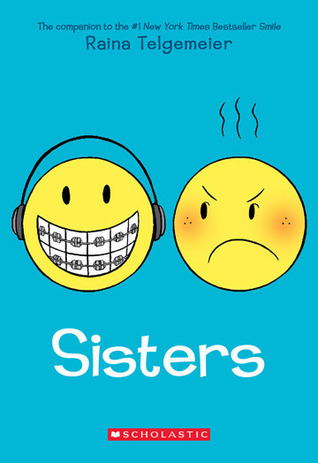 Smile is something I can see myself re-reading numerous times, but Sisters not so much. It's more a statement about me than about the books though. Both stories are delightful and must reads, even for people who normally steer clear of middle grade. Recommendation: Buy Sisters and Smile! I loved Smile and it's my been top recommendation for those who want to try graphic novels and aren't sure of the format. I met Telegeimer at ALA and she was so nice. Can't wait to read my ARC! This one looks great! I hadn't heard of it, my 2 girls should read it! They are more into sci fi, but they can branch out it won't kill them! I will recommend Alane Adams, alaneadams.com. My girls read The Red Sun that she wrote and they loved it. This one may be their next read, a nice change! Such a fun cover, and I'm so glad to see you enjoyed this one, Alison! It sounds like a great story for people with sisters, and I fall into that category—twice! Lovely review. So glad to hear you loved this! I wasn't sure initially if I would like it as much as Smile but I really enjoyed it. I think anyone with sisters can totally relate to Raina's story. I know I had a good time reminiscing while reading. :-) Lovely review! This is new to me and I've never been a graphic novel kind of person, but you're really selling this! I've never had a sister, but I do enjoy reading about sisterly relationships, as well as nerdy coming of age stories. The traders miss out on dedicating due time in selecting the CFD broker and that is just because they feel that the broker has nothing to do with the trading success.